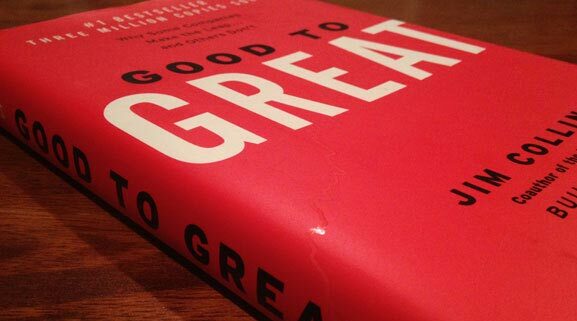 The good to great companies did not focus principally on what to do to become great. They focused equally on what not to do and what to stop doing. It is crucial to know who the right people are. If you cannot be the best in the world at your core business, then your core business absolutely cannot form the basis of a great company. You can accomplish anything in life, provided that you do not mind who gets the credit. I want to look out from my porch at one of the great companies in the world someday and be able to say “I used to work there”. Great leaders are not I-Centric; don’t talk about them. GREAT leaders; quiet, humble, modest, reserved, shy, gracious, mild mannered, understated. He/she creates peace out of war. They have almost stoic determination to do whatever needs to be done, to make the company great. Look for situations where extraordinary results exist, but where no individual steps forth to claim excess credit. Most great CEOS come from inside the company. The main point is first to get the right people on the bus. The sheer rigor needed in people’s decisions is crucial. The right people will do the right things and deliver the best results they’re capable of, regardless of the incentive system. Some basic questions give us insight into the core values of the person. The best people do not need to worry about their position and can concentrate fully on their work. Letting the wrong person hang around is unfair to all the right people. Put your best people on your biggest opportunities not your biggest problems. People love what they do, because they love who they do it with. Breakthrough results come about by a series of good decisions. You cannot make a series of good decisions without first confronting the brutal facts. Engage a dialog, and debate … not coercion. The key, then, lies not in better information, but in turning information that cannot be ignored. Just because it’s simple, doesn’t mean its right. What you are deeply passionate about? Doing what you are good at will only make you good; focusing solely on what you can potentially do better than any other organization is the only path to greatness. The only way to remain great is to keep applying the fundamental principles that made you great. You can’t manufacture passion or motivate people to feel passionate. You can only discover what ignites your passion and the passions of those around you. Not one of the GREAT companies focused initially on growth. We recognize that planning is priceless, but Plans are useless. Built a culture full of people who take disciplined action fanatically consistent. Much of the answer to the question of good to great lies in the discipline to do whatever it takes to become the best within carefully selected arenas and then to seek continual improvement from there. Sometimes becoming great takes tenacity not brilliance. If it doesn’t fit, don’t do it. Period. The challenge becomes not opportunity creation, but opportunity selection. To create great results requires a nearly fanatical dedication to the idea of consistency. You need to have lists of “Stop doing things” as “To do lists”. Once you know the right thing, have the disciple to do the right thing and equally important, stop doing the wrong thing. Take disciplined action fanatically consistent. From the outside those companies look like dramatic almost revolutionary breakthroughs. But from the inside, they feel completely different, more like an organic development process. Evolution is a whole different concept than change. When the going gets tough we go shopping ( companies). Two big mediocrities joined together never make one great company. We need to accumulate momentum, step by step and turn by turn. Alignment follows from results and momentum, not the other way around. We need to answer; why is it important that we exist? Preserve the core and stimulate progress. Embrace both extremes; Purpose&Profit; Community&Change; Freedom&Responsibility. It is much easier to become great that to remain great. Perpetuating mediocrity is an inherently depressing process and drains much more energy out of the pool than it puts back in. It is impossible to have a great life unless it is meaningful. You cannot have a meaningful life without a meaningful work. We have to leave this world knowing that your short time here on this earth has been well spent and mattered.